Today’s Cable Pick Of The Day should by all rights be Cable Pick Of The Everyday, because whenever Michael Ritchie’s Diggstown happens to flash by when I’m flipping channels, I will stop and watch it to the end. It’s that satisfying. (I even called my fantasy basketball team The Diggstown Ringers for a time, which was apropos, given the conclusion of this movie.) One of the great, underrated comedy directors of the 1970s—The Candidate, Smile, and The Bad News Bears were all his—Ritchie was on a bad streak (The Golden Child, The Couch Trip, Fletch Lives, etc.) when he got to Diggstown in 1992, but like the aging bruiser played by Louis Gossett, Jr., he found some of the old magic again here. Ritchie aligns himself with rogues and underdogs, and he finds a great one in James Woods as Gabriel Caine, a con man who’s sprung from his latest prison sentence and immediately gets back to work. 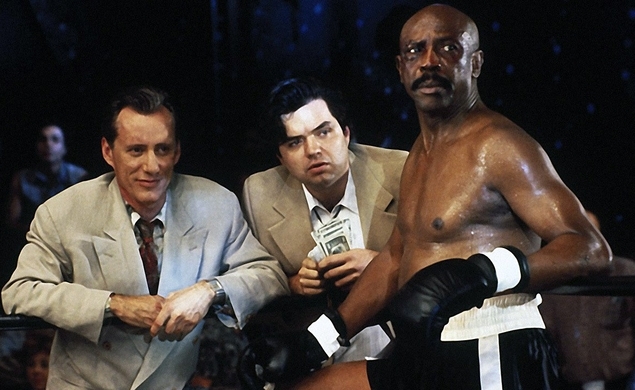 Along with his partner (Oliver Platt, also excellent), Caine sets up shop in Diggstown, a town known for its boxing scene, and makes a proposition to its cheerfully venal top dog John Gillon (Bruce Dern): For $100,000, he bets that his friend, “Honey” Roy Palmer (Gossett), a long-in-the-tooth pugilist, can defeat 10 Diggstown boxers in one 24-hour period. The fun of Diggtown is the abundance of side action: Caine and Gillon are always looking for angles, and when one of them finally out-cons the other, it’s a triumph that nourishes the soul. The film airs today at 1:20 p.m. ET on Encore Action, and should never stop airing.